When making business deals, confidence will make it or break it every time. Especially when it comes to hiring new employees, it is important to show them the confidence you have in your company. The best way to build confidence is through preparation, more important is showing off through execution and then follow up. Even if you are not preparing to give your first interview, it is important to take into account all of the factors that go into today’s interviewing process. Luckily the overwhelming task is made easier with this Interview Preparation Checklist. The interview preparation checklist is an all inclusive template that is easy to use and is available for free! Simply download the interview preparation checklist template on this website to start customizing your interviewing process now! This template is re-writable to reflect your company’s standards. This template provides sections for comments, and it prints in an easy to read format. Simply download the interview preparation checklist, Customize, Print and Interview! Use the checklist before, during and after the interview process for best results. 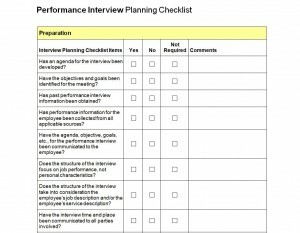 Share the checklist with other employees to keep everyone updated and on the same page (just in case the interviewer is sick the day of the interview!). Preparing the checklist will help the company identify boundaries and standards of potential employees. Always follow up after every interview with a conclusion as to why you would or would not employ the person. Preparing always relieves stress from any situation. So let us help you get prepared!Make it easier on yourself because the template is already here! Save and Open the file. Review the Interview Preparation Checklist, or highlight the question you want to rewrite and customize your own interview questions! You choose! Find out what skills are required and tailor the interview questions to reveal those attributes in the potential employee. Share the checklist with interdepartmental employees, anyone can give interviews! After interviewing, consider all answers and comments, then follow up accordingly.